Did you know Lincoln's assassin was the brother of one of the great 19th-century Shakespearean actors? The cast of The Brutes. Photo by Yvonne Allaway. BOTTOM LINE: A new smart but exhaustingly dense play about the Booth family (including both John Wilkes and Edwin) putting on Julius Caesar at the height of the Civil War. If you thought Thanksgiving with your family was tense, try turkey with John Wilkes Booth five months before Lincoln’s murder. In November 1864, the Booth brothers—Junius Brutus, Jr., Edwin, and John Wilkes—offered a one-time New York City benefit performance of Julius Caesar (with Edwin and Junius as assassins Brutus and Cassius, and John as Marc Antony) to raise money for the statue of Shakespeare that still stands in Central Park today. The Brutes, Casey Wimpee’s clever but overstuffed play being produced by spit&vigor, lets us be flies on the wall as the Booth family members rehearse, celebrate the holiday, and do their best to reach across the political gulf that separates the future president-killer from his staunch abolitionist kinsfolk. As a work investigating Shakespearean performance history, The Brutes wants to achieve some of the same goals as Theresa Rebeck’s Bernhardt/Hamlet, also about a famous 19th-century actor taking on the Dane. (When we meet Edwin, he’s getting twisted up in knots between rehearsals for the benefit and a Hamlet that will open the day after Julius Caesar.) I found Wimpee’s juxtaposition of Shakespeare and history more deliberate and inspired than Rebeck’s, the friction of Julius Caesar’s simultaneous anti-tyrant and anti-revolutionary stances rubbing up explosively against John’s burgeoning plot. The Booth siblings also tend to speak to each other in Shakespearean quotations, a familial shorthand that is alternately playful and weighted with their shared history. This is sometimes effective, especially when John and Junius Jr. work towards smoothing out their differences by enacting a brotherly sword fight from King Lear, and sometimes awkward, as when Edwin toasts the Union, declaiming, “May it continue to be” and John responds menacingly, “Or not to be.” Wimpee’s dialogue also has a tendency to swing from Elizabethan to millennial, bypassing antebellum altogether: “Don’t say fire—it’ll trigger me” Asia Booth Clarke, the only Booth sister included in the play, requests after an arson attempt at the theatre. Despite this well-packaged setup, the problem is that, across the work’s dense 75 minutes, none of the characters shift from their starting positions. We all know what move John Wilkes Booth makes next, and this historical inevitability robs the play of its momentum. It’s as if Wimpee picked the right people but the wrong moment in which to drop into their lives; the play feels as if it could be the middle third of a more epic, less emotionally static work. The Brutes’ conflicted center—is this play really about Shakespeare, or the Civil War, or a family divided?— means that Wimpee misses out on, for example, depicting in human detail the fascinating repercussions for the family of Lincoln’s assassination: Junius Jr.’s imprisonment, Edwin’s long departure from the stage before his triumphant return, and Asia’s eventual flight to England. In its current form, The Brutes is rather long on Stoppardian erudition and metaphor and less invested in how the siblings impact one another, even though it's clearly the pressure-cooker of a Thanksgiving dinner scene that sizzles most sharply. Fellini, doubling as director, produces a lively variety of stage pictures in the small in-the-round space. There’s often a sort of centrifugal force to the rehearsal scenes as Asia and her husband circle the actors, giving notes and calling out stage directions while the brothers recite. The lurking presence of four “Brutes” (Xandra Leigh Parker, Becca Musser, Morgan Zipf-Meister, and Harlan Short), bird-masked Confederates toting pistols and rifles, is successfully creepy when they’re in the background making eerie noises as John Wilkes schemes, but the quartet ends up further muddying the over-brimming waters in a pair of puzzling scenes where they curse at—and then start executing—one another. Chelsie McPhimily’s expressive lighting goes a long way, though, especially in the ghost scenes (did I mention those are packed in there too?) in which Edwin confronts the spirit of his father (Eamon Murphy) while illuminated in a haunted, purple glow. As he incites the crowd to riot in Julius Caesar’s third act, Marc Antony claims that “I have neither wit, nor words, nor worth / Action, nor utterance, nor the power of speech / To stir men’s blood.” Of course, Antony knows full well he has all of those attributes in spades. Here’s hoping in its next staging, The Brutes will pick up a bit of Antony's blood-stirring power to go with its healthy helping of wit, words, and action worth watching. The Brutes is by Casey Wimpee. Directed by Sara Fellini. Lighting Design by Chelsie McPhimily. Stage Manager is Emma Frances Philipbar. 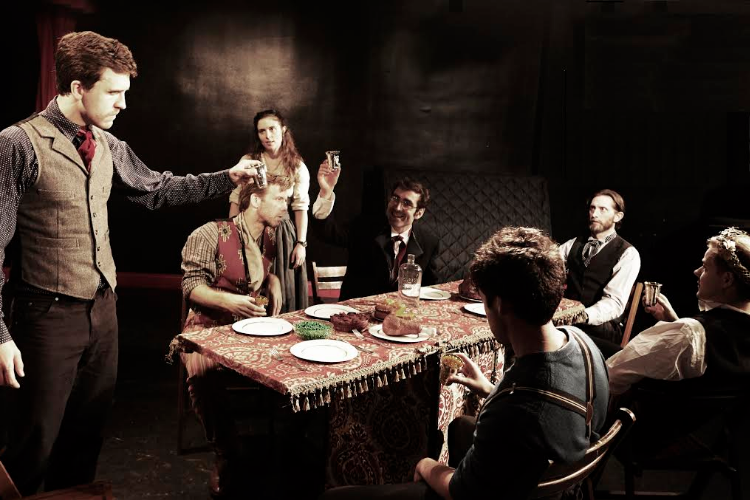 The cast is Adam Belvo, Sara Fellini, Colt W. Keeney, JD Martin, Eamon Murphy, Becca Musser, Pete Oliver, Xandra Leigh Parker, Harlan Short, Nicholas Thomas, Perri Yaniv, and Morgan Zipf-Meister.